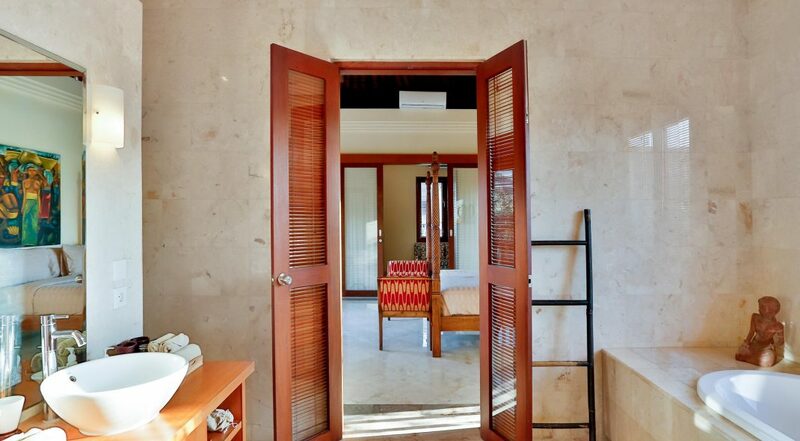 From $ 543 $ 461AUD per night We have direct contracts with most villa owners. We don't add any booking fees. We are 100% transparent with no nasty surprises. 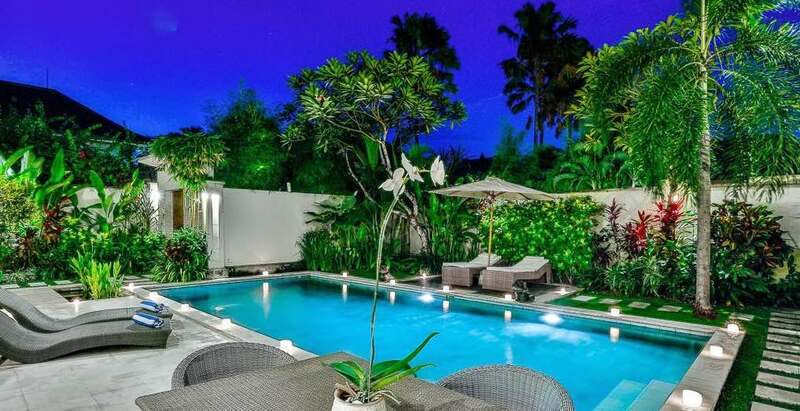 Lovely 11 m swimming pool – the kids will love this! 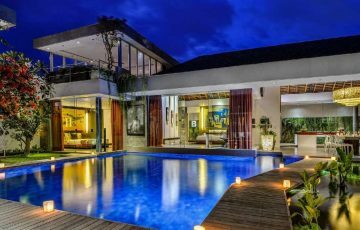 This is such good value for a family or group coming to Bali that wants to experience villa holiday living in complete luxury. 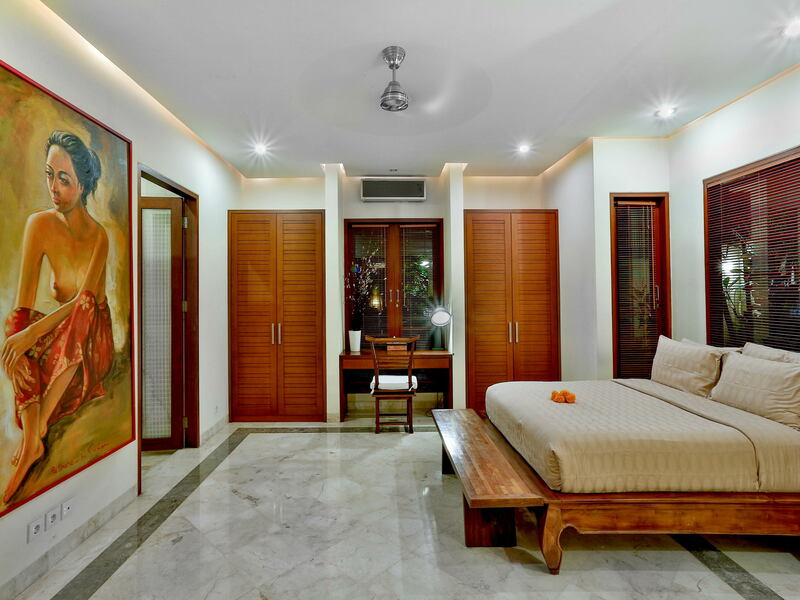 Situated in a private gated villa complex, The Residence Seminyak, Villa Shanti is a 4 bedroom Seminyak holiday villa rental & offers guests a fantastic central Seminyak location just one street back from Eat Street. 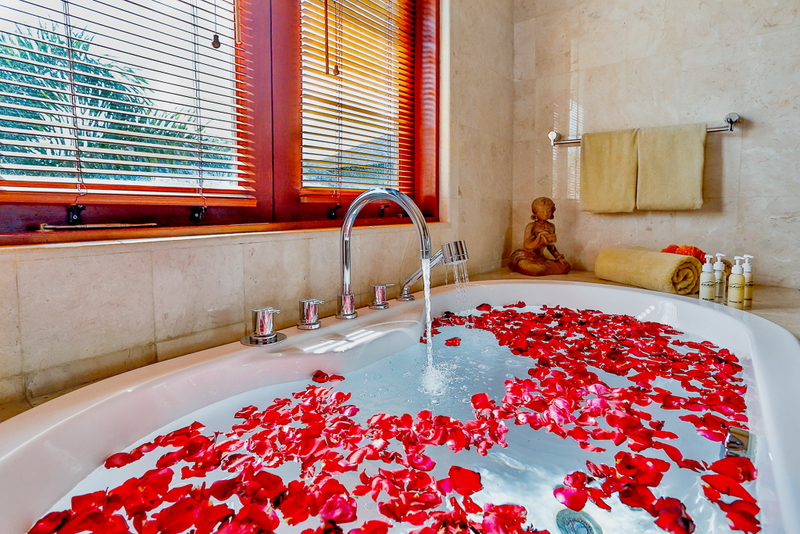 The complex offers 24-hour service with a concierge and hotel style services. 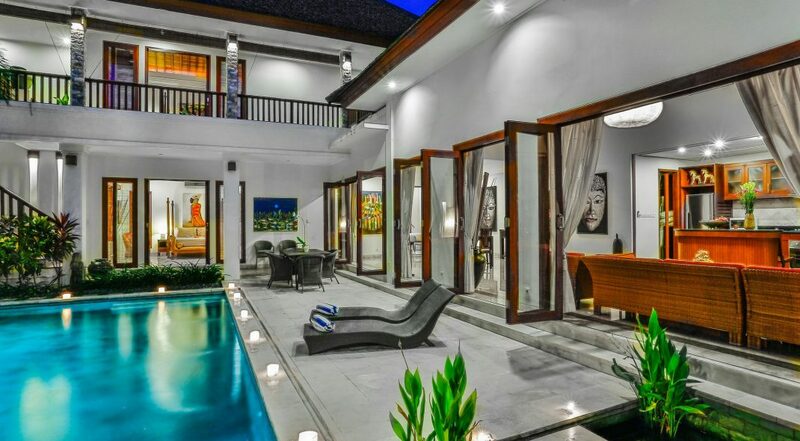 This grand two-storey holiday home with its own private pool and fine furnishings will certainly appeal to families and groups of friends wanting to be right in the action, vibrancy, colour and exhilaration of Seminyak. 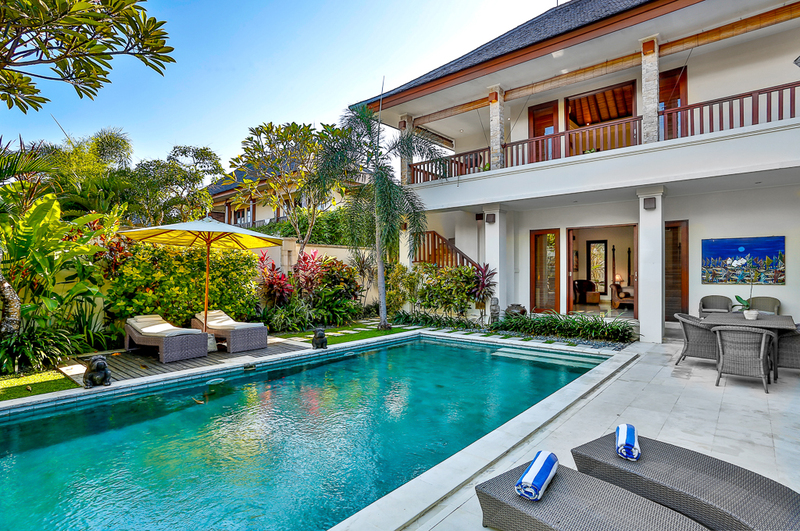 The kids are going to have plenty of fun in the 11 meter pool surrounded by lush tropical gardens. 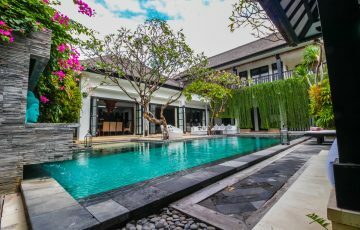 The poolside terrace runs along the living area and there is an outdoor setting for meals throughout the day and sun lounges on each side of the pool with parasols and plenty of mature tropical trees and greenery giving that authentic Bali feel. 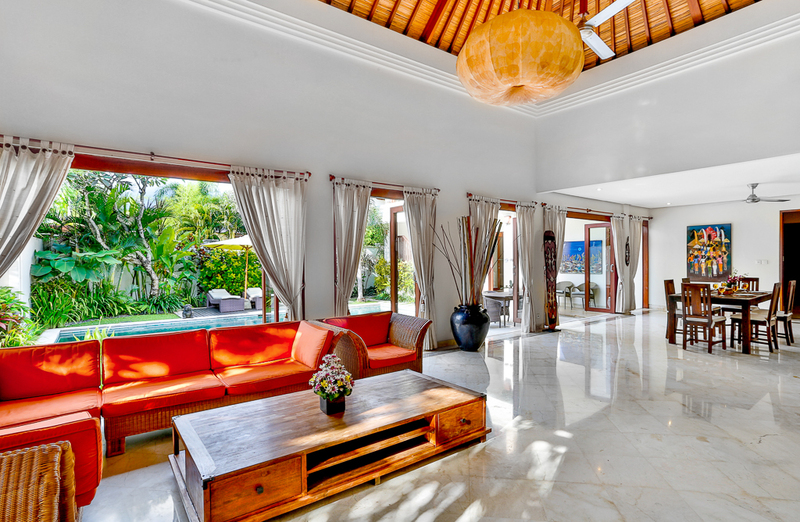 The living area with its traditional Balinese high pitched ceiling opens directly onto the pool terrace, large doors open up so you can let the tropical breezes filter through circulated by the ceiling fans or reside in the comfort of air-conditioning. 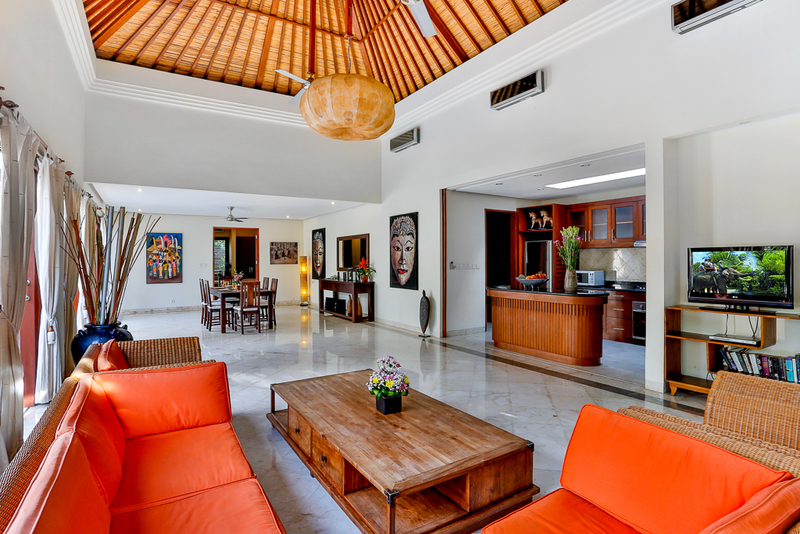 A large rattan sofa in front of the large plasma TV with DVD and cable channels, well equipped kitchen in case you feel the urge to do some cooking and a dining table for 8 guests. 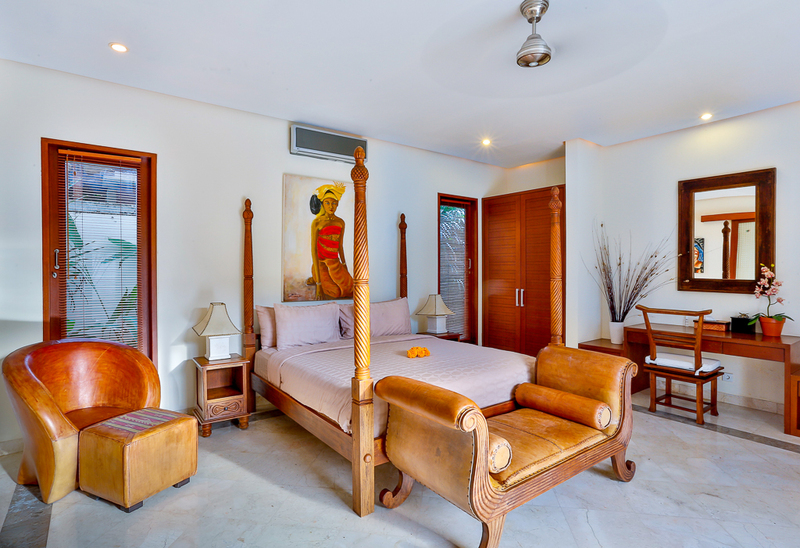 On the upper floor you will find two beautifully appointed bedrooms with a shared en-suite while on the ground floor two more bedrooms boast private en-suites. 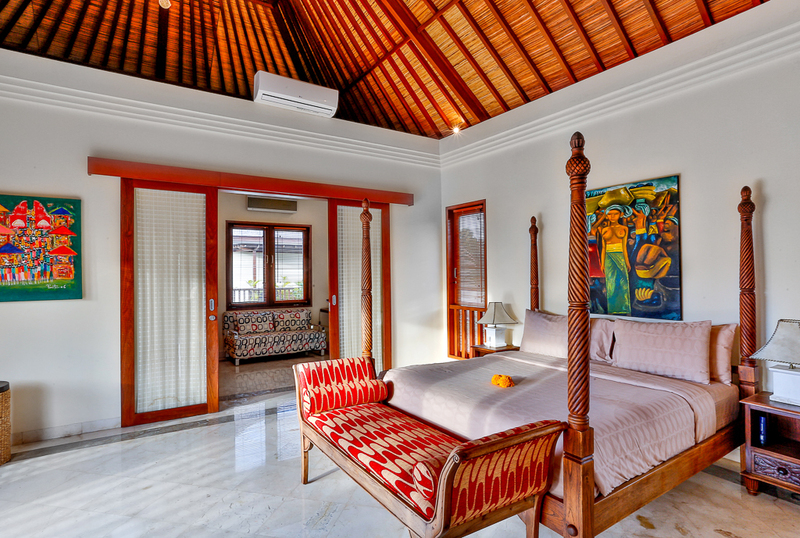 Guests can enjoy the comforts of king size beds in three of the bedrooms, one room on the upper level has a double four-poster bed with its own private study area and a sofa bed, ideal for kids. 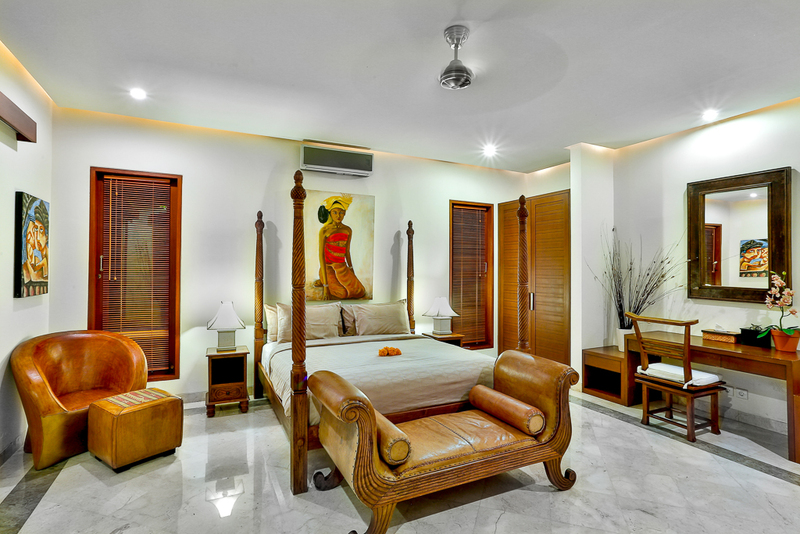 The complex is managed by a professionally trained team of Balinese staff. 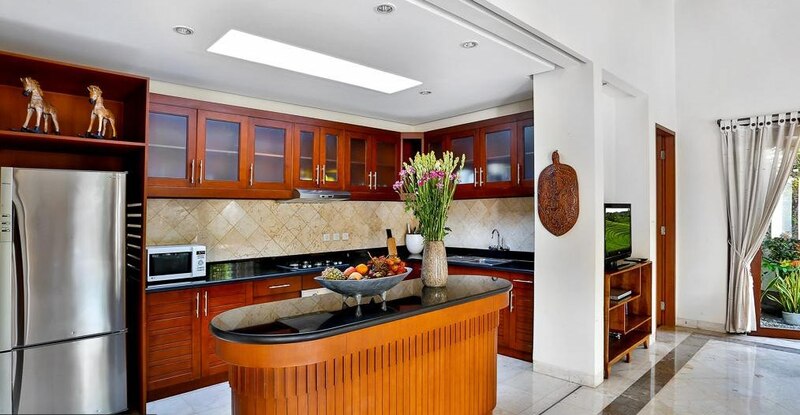 Each day they will prepare a breakfast of your preference in the villa and if you would like catering for lunch and dinner as well – just ask the staff. 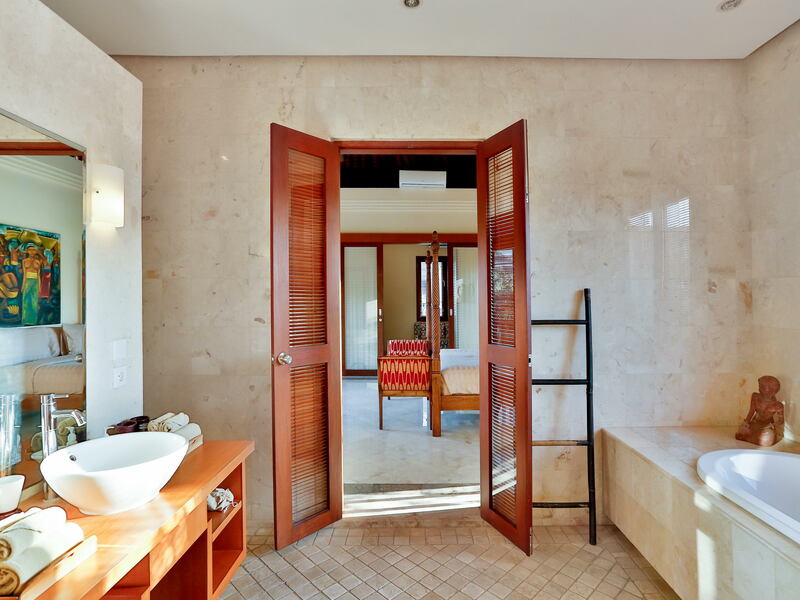 The housekeeping team will clean the villa daily and you can pick up the phone and call the concierge desk at any time for assistance. 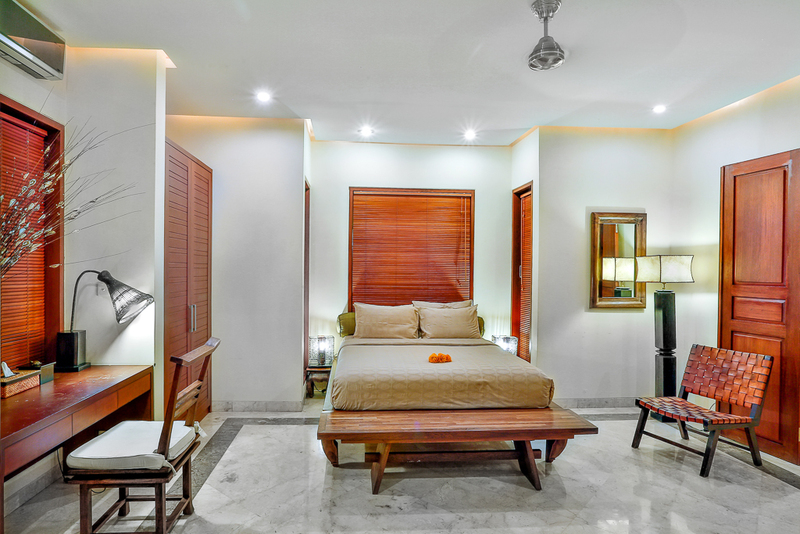 A stay here is all about total relaxation and making sure your holiday is perfect. 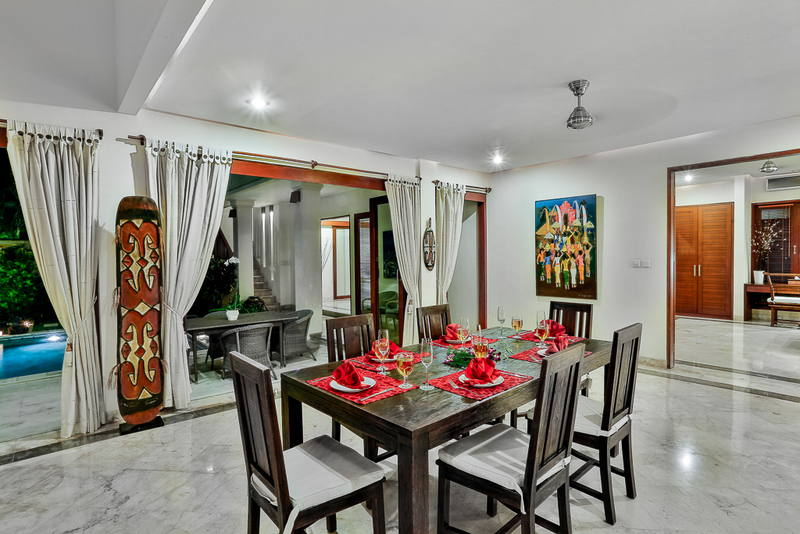 The villa complex is located on Jalan Mertasari which is extremely close to the really popular Eat St where there are many dining & shopping options. Just to the left as you exit the complex is a fine dining restaurant serving rustic Italian food, Settimo Cielo, an amazing fine dine experience. 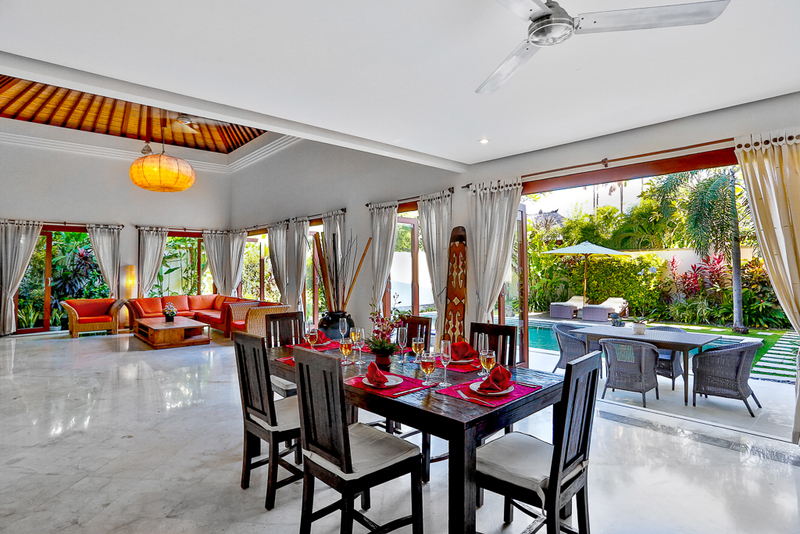 Happy Chappy’s has great Chinese food and one of Seminyak’s most famous restaurants, Ultimo is just a short stroll. If you are looking for some night life head to Motel Mexicola, Red Carpet or La Favela, which are all within walking distance. 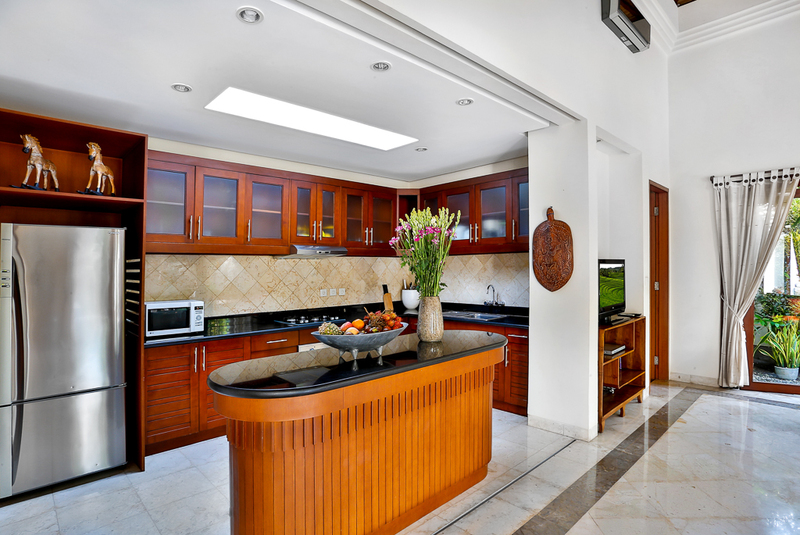 If you are a foodie, love to shop or browse amazing boutiques, then this is the perfect villa for you. If you are coming here with kids and are worried that they might get bored, don’t stress as there’s heaps of things for them to do nearby; Finns Club (with water slides, ten pin bowling & trampolines) Waterbom Park, the beach and the Kuta Boardwalk are all a short taxi ride away. 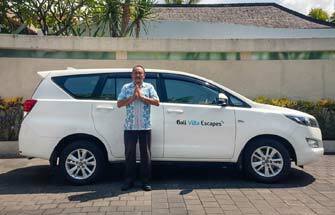 Just speak to your villa manager about organising a metered taxi to get you there. 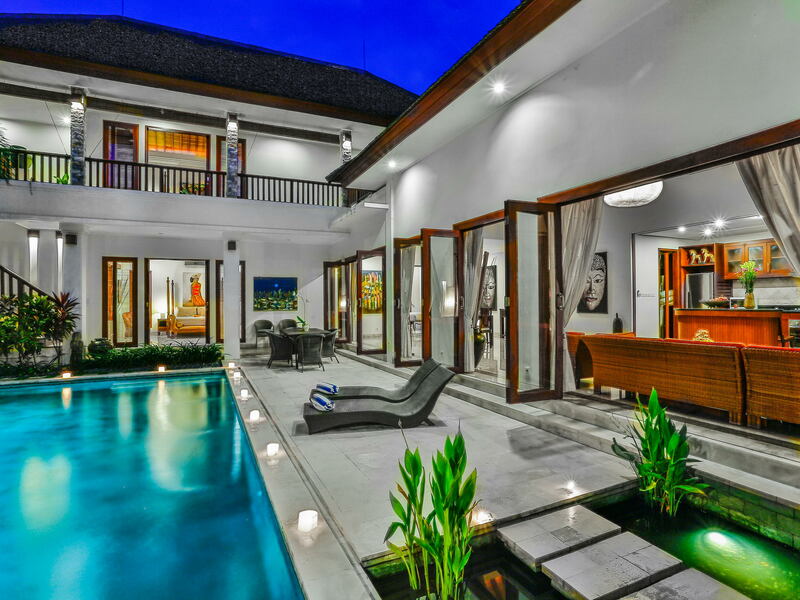 To view our full range of Bali Villas or other 4 bedroom Seminyak villas in the same price range please browse this website or contact our reservation team. 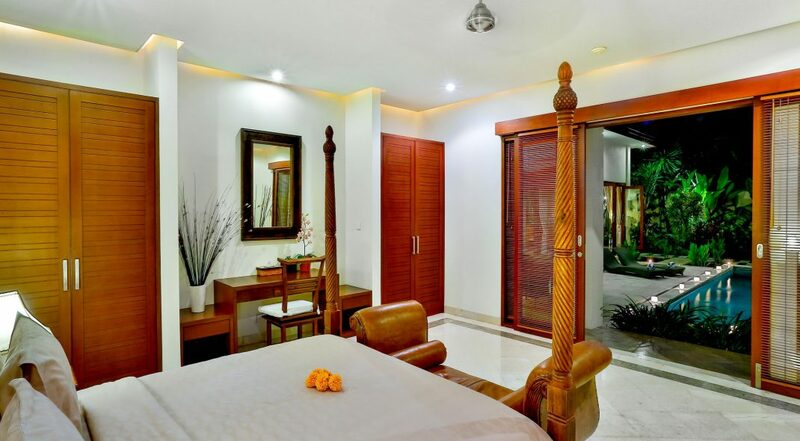 This is a popular Seminyak holiday villa so please book Villa Shanti well in advance, especially if your planning a trip to Bali during the Australian school or public holidays. 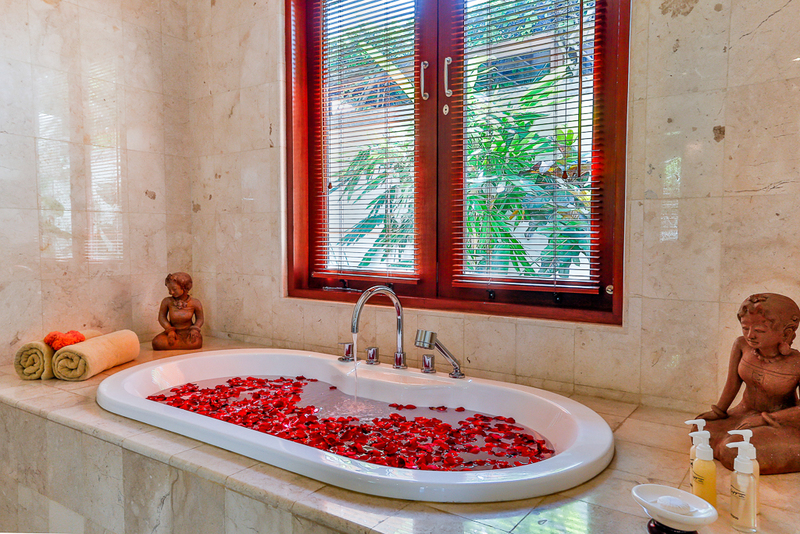 Fabulous amenities & the friendliest Balinese staff we have ever met - they were professional & very polite. We went there in a group of 8 (4 adults and 4 children) and had a really relaxing time. 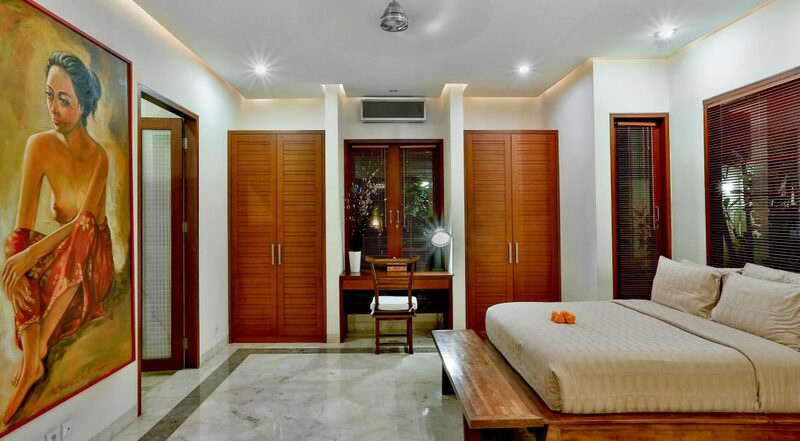 The location was exactly what we were wanting ( very central and convenient Seminyak position), which was really handy for those dinners at night. The kids loved going to Seminyak Village which was just around the corner. 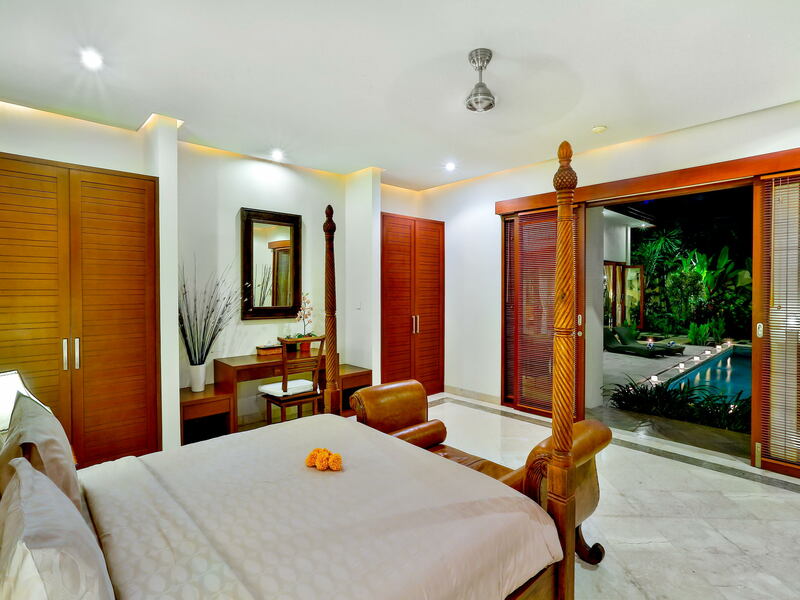 The bedrooms were large and really well maintained; clean, fresh and sparkling new everyday - could not ask for more - thanks to the Bali Villa Escapes team for organising this for us - it was well worth it and will be coming back next time for sure. We had such a wonderful time in Bali! 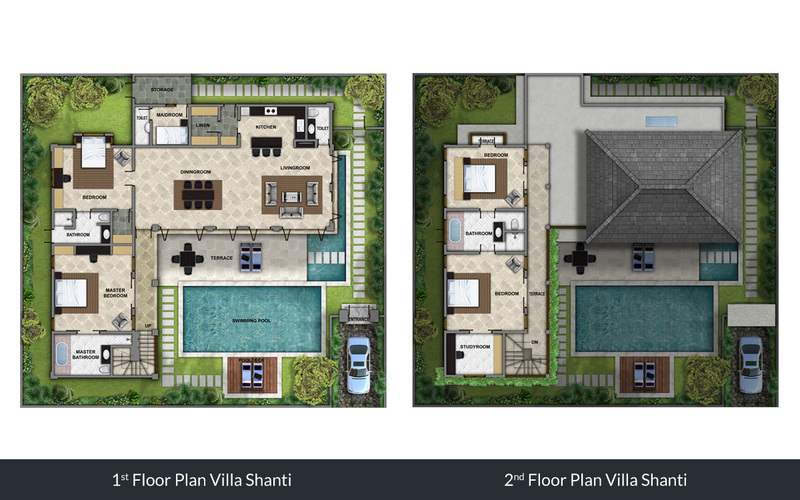 If you could please pass on our feedback to the management team at The Residence, Villa Shanti for our butler Dewin who was amazing! He went above and beyond to make sure we were comfortable and always taken care of and greeted us with a warm and friendly smile each ans every morning. He was so kind to us and really made our stay at Villa Shanti better than we could have expected. Please let his boss know that he provided outstanding service and made our stay so much more enjoyable. Nothing was too much trouble for him and even with the 3 kids, he was always friendly and made sure he knew all of our names from the first day we met him. Absolute bliss - this is how we would describe our 8 days here over Easter. After being picked up at the airport we arrived at the villa to find the staff there waiting to greet us with a welcome drink - the rest of the holiday went according to this fabulous daily routine. 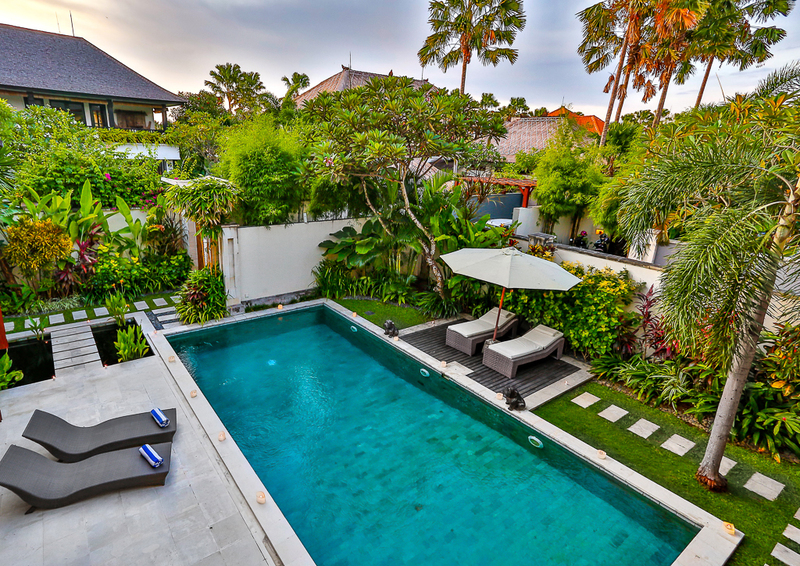 Lovely breakfasts, walk to the beach, hang by the pool, chill out time and then off to some fab restaurants in Seminyak. Our family is very impressed and can't stop talking about the awesome time we had. Loved the location as it was really close to all those great shops. 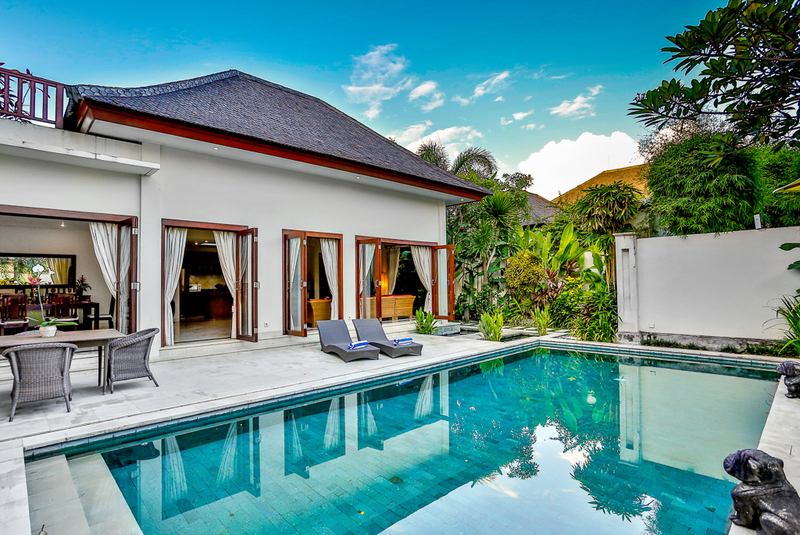 The staff were always happy to help and were very friendly and the overall villa facilities were much better than we expected - this was an absolute treat. 10 out of 10 from our group of 6 people. 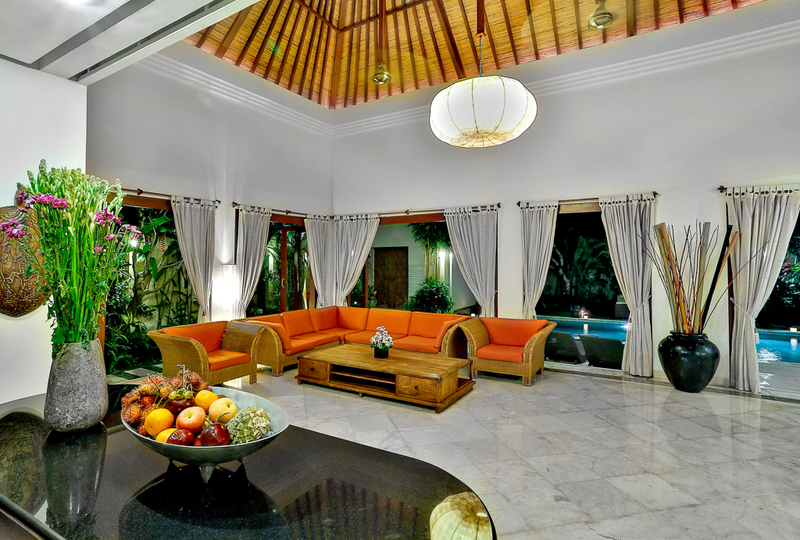 Convenient location and lovely facilities made Villa Shanti a lovely holiday experience. Being at the Residence was like staying in a 5 star hotel but better. To all the staff at Villa Shanti, thanks so much for a wonderful holiday and looking after us. We will be back. 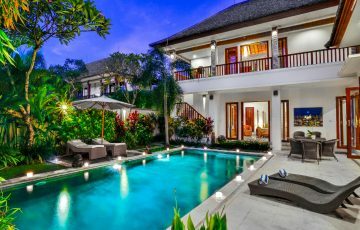 Our group were over the moon with our Villa. It was exactly like was advertised on the Website. ALL of the staff were beyond helpful. From organising an Emergency Dentist appointment for one of the Girls to arranging McDonalds at 1am for us after a big night out and Pizza Hut for a casual lazy day lunch at the Villa.